Shared on social media to spread awareness, Evelyn. More harassment against free speech. One of these days, the ADL may well find it has bitten off more than it can chew, and wake up to grasp that abuse and tyranny over others only backfires, in the end. Freedom of speech anyone?! Thanks for posting, Evelyn!! Thank You Evelyn for sharing. Noted. Doesn't it somewhat reminisce of the 60 s when the American youths courted arrest protesting against the Vietnam policy of the USA? The worry is, humankind doesn't learn. History doesn't necessarily repeat itself - but it does rhyme. 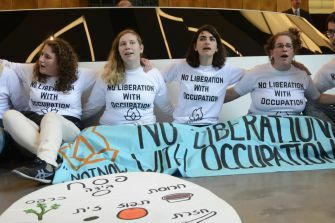 Good to see people out to protest Israeli occupation, sad to see their protest nipped in the bud by (Jewish) establishment, who seem to have a monopoly on free speech. 'Israeli forces have killed over 5,500 Palestinians in the last 15 years and not one soldier has been prosecuted for murder. It is truly amazing how "Freedom of Speech" is given and taken away depending on the subject. Funny enough it doesn't seem to bother too many people ... or are they just meantime so numb that they don't care anymore? We'll never now but it's an interesting phenomenon. Thanks Jess for this additional info. "... and only one soldier was convicted of homicide in the case of the killing of a foreign national." This wouldn't have to do with the fact that it was not "just another Pali" ...?! Do I remember Tom Hurndall! He was murdered while trying to shield children who were playing when fire erupted. Some froze and all he was doing ... was trying to protect them when he got killed by a sniper despite the fact that he wore a bright orange jacket (worn by foreigners (ISM) at the time). We should also not forget that this brave young man was for nine month in a coma before he died. They were protesting in the lobby of a private building. That's not free speech. That's trespassing and harassment in other people's workplace. If they want to protest, they are free to do so on public property, even on the street in front of the building, after acquiring permits which authorities must provide unless there are practical issues or safety considerations preventing them from doing so. They are free to protest as much as they want, just not free to be stupid about how they do it.